5. Enter your Unique Coupon code, Your Name, Mobile Number, Email Id and select your City. 6. You will receive Authentication code via Email. 10. Use this eGift voucher to get Rs.100 discount on Movie tickets booking at Paytm. 3. Registration is valid from 10/06/2017 to 10/09/2017 and authentication code is valid for a period of 30 days from the date of registration of voucher. 4. Voucher code can be redeemed only on partner website. This can not be redeemed directly at venue. 6. Discount offered is on one transaction only irrespective of number of movie tickets purchased. 7. This eGift voucher can be used only for booking movies on Pytm.com or Paytm App. 8. This eGift voucher can not be redeemed or exchanged cash or credit nor can be exchanged for another gift voucher/Gift card. Als, it can not be re-validated once past expiry date. 9. This eGift voucher can not be exchanged for smaller eGift voucher denominations. 10. A maximum of only 7 vouchers can be redeemed per person, per mobile number per week during the promotion period. 11. This eGift voucher is for one time redemption only. In case of partial redemption left over amount will be forfeited. 12. If the eGift voucher is lost, misplaced or stolen, neither will a new eGift voucher will issued nor will the money be refunded in any manner. Duplicate eGift voucher will not be issued. 13. Paytm shall not be liable and responsible for any unauthorized and/or fraudulent purchase/s mae using this eGift voucher. The holder of the eGift voucher shall be solely responsible for the safe custody of the eGift voucher and the credentials mentioned on it. 14. Paytm may charge (add to, delete, or amend) these terms from time to time, Unless stated otherwise, the changes will apply to any new Paytm Vouchers that you purchase and are for personal, non-commercial use and enjoyment only. The same may be shared with family and friends, but may not be advertised, sold or used as promotional items by the purchaser or anyone else without Paytm’s prior written consent. 15. In addition to these terms and conditions, Paytm gift card(s) an their use on our website are also subject to Paytm’s general terms or use. Paytm decision will be final in case of any dispute. 16. Multiple gift card(s) can not be used in a single transaction & the gift card(s) can not be combined with any other running promotional offer on Paytm. 17. If the order amount exceeds the gift cod amount then complete your Paytm via Paytm wallet/Credit card/debit card/ Net banking. 18. This is strictly a one time usage code. 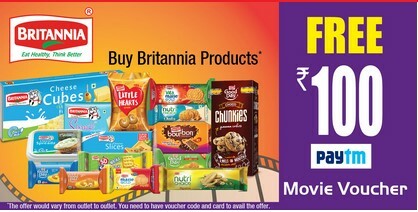 Tag :- Paytm Britannia, Paytm Britannia Offer.